This week it was my turn to set the challenge, and so I chose to make it something to do with Framelits. They are such fun to use, and especially if you have one of the New Magnetic Platforms. They take away the need to use Post it Notes to keep your Framelit in place. I chose to use the Labels Collection Framelits that I received when they first became available to us at Stampin Up. Originally when I made my card I used a negative from another time and sponged the background area, using Crushed Curry, Cajun Craze and Melon Mambo. I thought it looked a bit 'flat' so I cut it out using the framelits. My colour combo is pure Colour Coach, and to be honest I had forgotten how lovely Melon Mambo looked against a back ground of Old Olive and Elegant Eggplant. The Old Olive I ran through the Big Shot using a new embossing folder which is available from the 1st September. 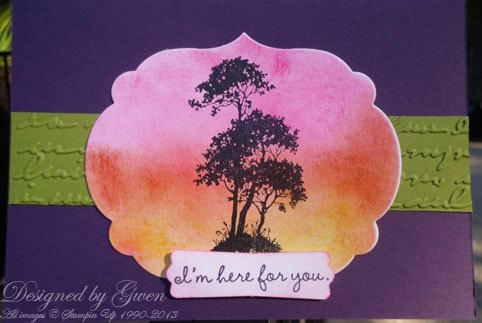 The image from Serene Silhouettes I stamped in Black Stazon and the sentiment I stamped using Elegant Eggplant was Occasional Quotes. 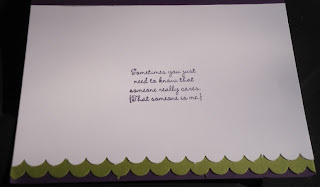 On the inside of the card I used the Scallop Punch and punched along the bottom edge of the Whisper White insert and also along the edge of a piece of Old Olive which I put behind the Whisper White. 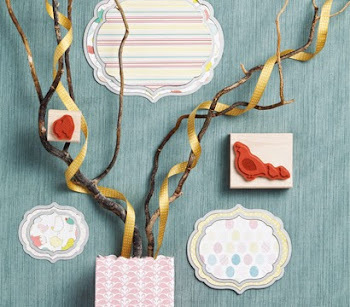 The sentiment, when stamped I punched out with the Modern Label Punch and sponged the edges with Melon Mambo. I do hope you will find time to play along with week at Sunny Challenges and Creations, and please pop along and have a look at Kris and Vicky's Creations as well as our guest designers. Till next time Happy Stamping. Beautiful Gwen. Your sponging creates the perfect background for the silhouette image. 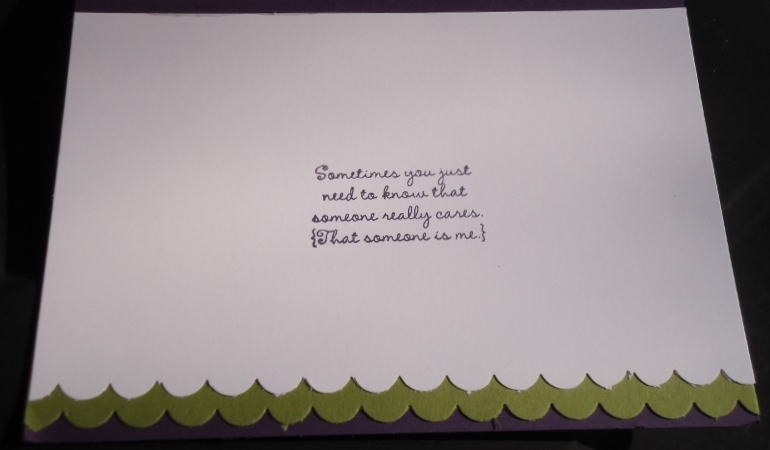 The finishing touches on the inside of your card are lovely too. Wow! Those beautiful colours are so striking Gwen & the sponging is out of this world! Love it!